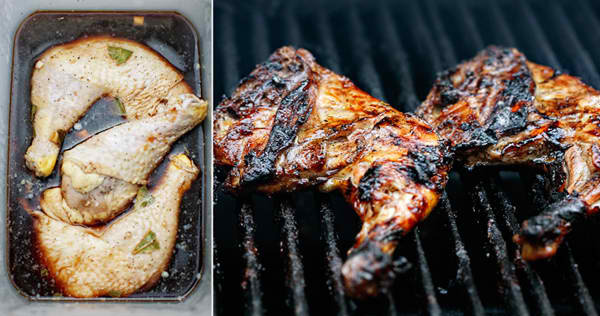 Filipino barbecue is often marinated in a mixture that includes 7-Up or Sprite, likely for its tenderizing effect. Our family recipe contains no catsup, which is often mentioned in online recipes as either part of the marinade or a component of the basting mixture. This chicken is incredibly moist and flavorful, and the reduced marinade has just the right balance of sweet and savory, having cooked off the tartness of the vinegar. Paired with achara (pickled green papaya), it’s a classic Filipino combination. If you have concerns about boiling the used marinade, double the measurements for the marinade and set half aside for the basting mixture. In a large container that can hold the chicken pieces, combine all ingredients except chicken. Mix until sugar is dissolved. Marinate chicken in the refrigerator for at least 3 hours or up to 8 hours. Take the chicken out and transfer the pieces to a large plate. While waiting for the chicken to come to room temperature, pour the marinade into a small sauce pan (or discard the marinade and pour the additional reserved marinade into a sauce pan) and boil over medium heat until the marinade is reduced to a sticky syrup. Heat your grill to 350 degrees or medium heat. 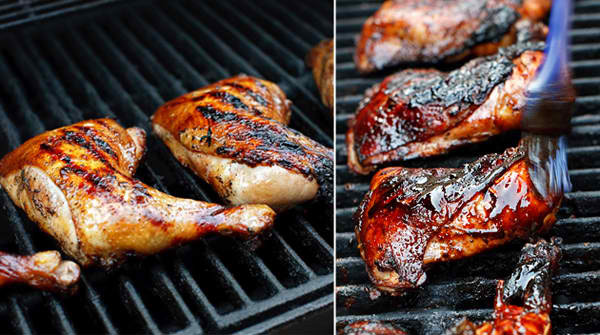 Grill chicken pieces, bone side down, for about 8 minutes, then reduce the grill temperature to 275 degrees. Continue grilling bone side down for about 20 minutes, basting once. Flip the pieces over and grill for another 20 minutes, basting occasionally. Continue grilling, flipping, and basting until chicken is fully cooked. Check for doneness by piercing the joint to ensure juices run clear, or until chicken reaches 163F internal temperature. 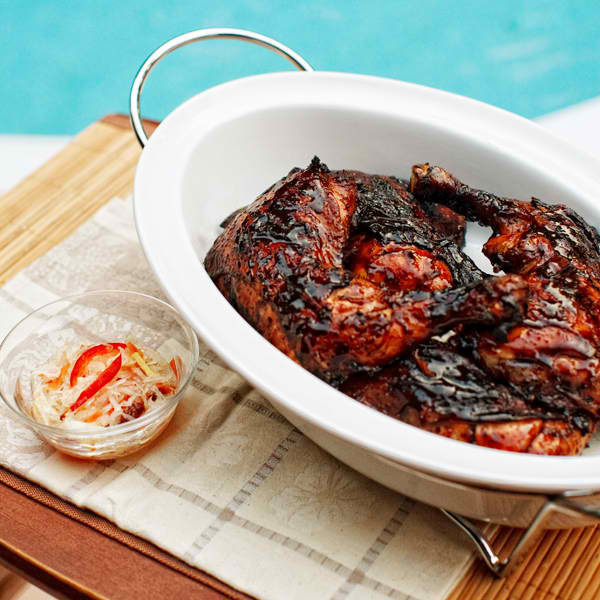 Take chicken off the grill, tent with foil, and let rest for about 5 minutes before serving.